MINNEAPOLIS -- One year after making history as the first ever No. 1 seed to fall to a No. 16, Virginia has broken through with its program's first-ever national championship. If you ask Tony Bennett, the players on the team or any of the alums in the house in Minneapolis or across the country, I doubt anyone would have things play out any other way. 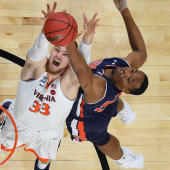 Virginia's 85-77 overtime win against Texas Tech will go down as one of the best title games in recent memory, eclipsing the doomsday-type editorializing that rolled out in light of these two slowed down, elite defensive teams winning in Saturday's semifinals. When the game started with both teams going a combined 1 for 10 from the field, the jokes started to roll. When the game started to roll back and forth with the lead changing every couple of minutes, no one was complaining about the fact that this game went to overtime. De'Andre Hunter was absolutely stellar on the biggest stage, putting up a career-high 27 points on 8-of-16 shooting with nine rebounds while often going head-to-head against fellow NBA prospect Jarrett Culver. Hunter hit four of his five 3-pointers in the performance, none bigger than this clutch go-ahead 3-pointer with two minutes left in overtime. Hunter wasn't on the court last year for Virginia's loss to UMBC because of an injury, and he even got off to a slow start with just five points in the first half. But just like in the Auburn game, Hunter flipped a switch after halftime and stood out as the most impressive player on the court. It wasn't easy, and probably was never meant to be easy for Virginia. This is a program that has only three Final Four appearances in its history yet has consistently battled with Duke and North Carolina for ACC supremacy at different times across the decades of the league's history. Bennett has won four ACC regular season titles, but now he's shed any and all criticism and silenced doubters by delivering to Charlottesville what no Virginia coach has done before. This national championship is the kind of thing that forever changes a college basketball program and its coach. Winning begets winning in this sport, and it took Virginia hitting the lowest of the lows last March before it could reach the highest peak. Here's a quick look at the Final Four All-Tournament team. CBS Sports was with you for complete coverage of Monday night's title game from Minneapolis, Minnesota, with our live blog below. If you are having trouble viewing the blog, please click here.